Asher Elmaliach, who was stabbed through the heart by an Arab terrorist Sunday, stabilizing after being in critical condition. The security who was nearly killed in a stabbing attack Sunday afternoon is no longer in any immediate danger, officials at Shaarei Tzedek Hospital reported Tuesday morning. 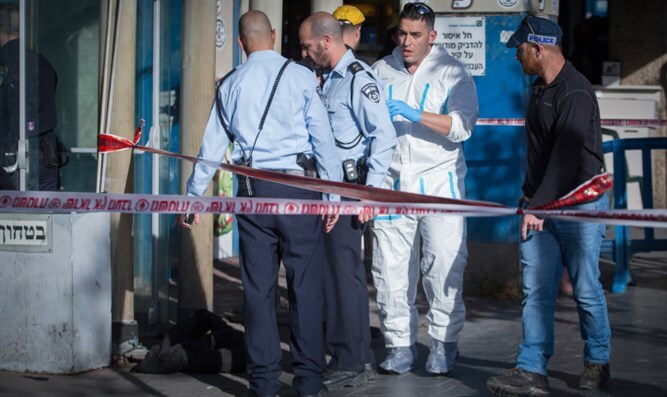 Asher Elmaliach, the 46-year-old security guard who was stabbed Sunday at the entrance to the central bus station in Jerusalem, showed signs of improvement Tuesday, though he remains in serious condition. Hospital officials say Elmaliach, who is still being treated in the intensive care ward, remains sedated. As closed-circuit television footage of the incident reveals, the terrorist approached the central bus station’s main entrance, removed his jacket, then quickly drew a knife, stabbed Elmaliach, then fled the scene. Police quickly apprehended the perpetrator with the assistance of another central bus station guard, who subdued the terrorist. Authorities identified the terrorist as Yassin Abu Al-Keraa, a 24-year-old Palestinian Authority resident illegally residing in Jerusalem. In a Facebook post uploaded several hours before the attack, Abu Al-Keraa hinted at his planned attack. During the attack, Abu Al-Keraa stabbed Elmaliach in the heart, causing what would under most circumstances be a fatal wound. Officials at Shaarei Tzedek Hospital described Elmaliach’s survival as a “Hanukkah miracle”, stating that if the ambulance carrying Elmaliach had been delayed even a matter of minutes, he would not have survived.